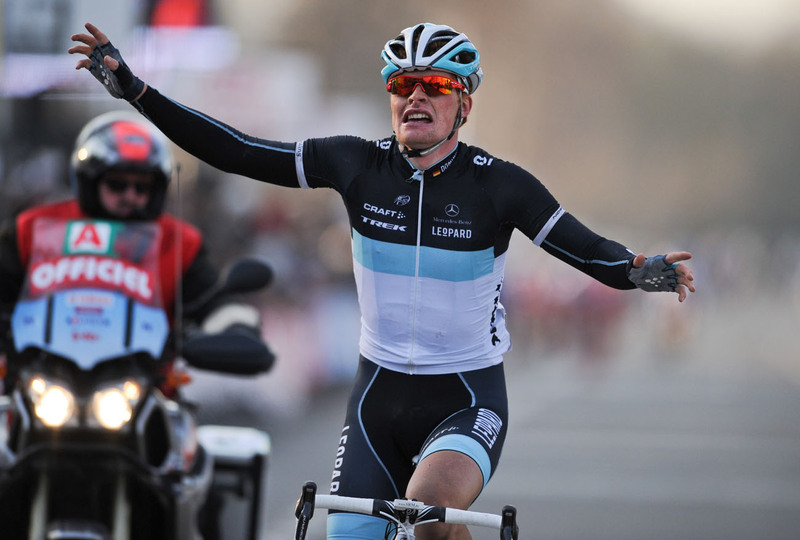 Dominic Klemme gave the new Luxembourg-based Leopard-Trek squad its first victory, soloing to win the GP Samyn in Belgium on Wednesday. Klemme took the initiative after chasing down and passing escapee Kevyn Ista (Cofidis). Ista finished second, eight seconds behind the 24-year-old German. Robert Wagner gave Leopard-Trek a second podium spot by bringing home the chasers for third. Britain’s top finisher was Adam Blythe (Omega Pharma-Lotto) in 36th, 3-36 down on Klemme. The UCI 1.1-ranked GP Samyn was first run in 1968, and recent winners include Magnus Backstedt (2002), Robbie McEwen (2004), Philippe Gilbert (2008), Wouter Weylandt (2009) and Jens Keukeleire (2010). Leopard-Trek was formed in part by Klemme’s former Saxo Bank team-mates Frank and Andy Schleck, who led an exodus from Saxo Bank that also included time trial world champion Fabian Cancellara and Stuart O’Grady. Up until Klemme’s victory, Leopard-Trek have been without a win in its inaugural season.